Deciding whether you should repair or replace your fence can be tricky. 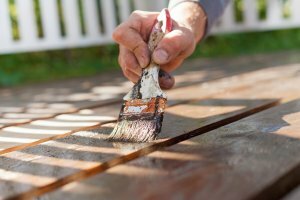 In some cases, a coat of paint or minor repair may be cheaper, but in other cases, it may be cheaper to replace the entire fence, rather than performing extensive repairs. The decision to repair your fence or replace it relies heavily on the condition of your fence. Fence Maintenance Service, your premier fence company in Pittsburgh, has put together a few tips to help you determine the condition of your fence, so you can decide whether repair or replacement is best to meet your fencing needs. There are a few common issues with aluminum, wood, and vinyl fences that can be repaired and save your fence from replacement. Although aluminum fences are one of the most durable options out there, they still have parts that will sometimes require attention or replacement. Aluminum fences can also be damaged by an accident and fence posts can be loosened by shifting soil. To repair a damaged aluminum fence, it may be necessary to replace an individual rail or section of the fence. Depending on the type of damage, repairs may need to be completed by a skilled welder. If your fence posts have been loosened, they can be stabilized with backfills, such as soil or gravel. Other issues, such as a loose rail, can be resolved by using a t-brace. This will make the rail more stable and functional. Keep the color of the replacement part in mind if you don’t intend to paint the fence after repairs are complete. Vinyl is a popular fence option because it requires virtually no maintenance. Although it is easy to care for, it can still become subject to damage whether it be due to an accident or harsh weather. A significant threat to vinyl is cracking. Repairing a vinyl fence is simple. If you notice a cracked panel in your vinyl fence, it is best to replace the individual vinyl picket or the entire section of fence panel between the posts, depending on your style of fencing. It’s important to thoroughly inspect your fence if you notice any of these signs to help you determine the cause of the damage so you can prevent further issues by exterminating wood destroying insects or eliminating standing water that is warping your fence. Small holes and cracks can be repaired with wood filler or putty. This filler can be concealed by painting your fence. For more severe damage or warping, your best course of action is to replace the damaged boards or rails. A new board will be obvious for a while but may weather in time to match your old fence, or it can also be painted to match the rest of the fence. In some cases, replacing your fence is the most cost-effective option. If your fence requires major repairs, follow this general rule to determine if replacement is the best option: If you need to replace more than 20% of the fence pickets or fence panels, then you should replace the entire fence. It’s important to remember that fence posts are difficult to replace because they need to be dug out of the ground to be removed. To add to the difficulty, posts tend to be cemented into the ground, making their replacement labor intensive and expensive. Rather than replacing several fence posts, it would be more cost-effective to replace the entire fence. If your fence has simply reached its lifespan, manufacturer parts may no longer be available, so replacing your fence would also be the best option in this case. With proper maintenance, you can expect your fence to last between 20 to 50 years. Be sure to keep up with the recommended maintenance plan for your specific type of fence. The experts at Fence Maintenance Service can help you select the best fence for your property and can handle all your fence installation needs. Pittsburgh homeowners can choose from our wide range of vinyl, wood, and ornamental fence options to accent their home or provide added security. Contact us today to learn more about our fence installation services.